If you're listening to the show right now, you are listening to a nun--our own Maureen Fiedler has been a Catholic nun since 1962. 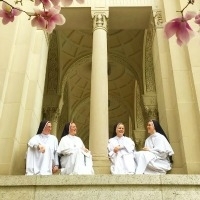 In Nuns Now we'll meet five nuns from very different backgrounds, including a cloistered nun who spends her day in quiet prayer, and a globetrotting activist whose work has taken her to scruffy border towns and even into police custody. We wrap up our Nuns Now series by addressing the elephant in the room. Like... where is everybody? Everybody young, that is? Why are so few women becoming nuns today? There are just 50,000 nuns in the United States, down 75 percent since 1965. We hear how more traditional orders are actually seeing membership rise, while expanded opportunities for women have made a nun's life less attractive for many. Gail DeGeorge is a journalist with the Global Sisters Report of the National Catholic Reporter.